We´ve had a lot of rain lately. Rained last night. Rained during the day. 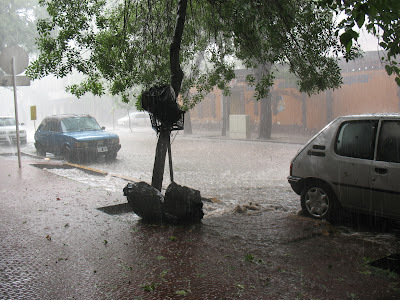 Rained in Mendoza last week and flooded the street. There was a good two inches of water in the street. Apparently, when it rains a lot, the entire city floods. Since it´s technically in the desert, they´ve installed a citywide irrigation system along the streets. Without that to take a lot of the water, it would have been quite ugly. 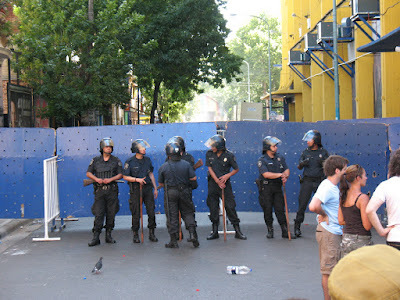 I caught another football game last week before I left Buenos Aires. 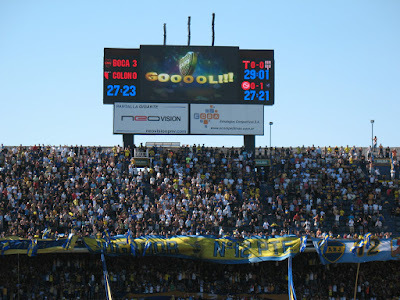 The last game of the season for the Boca Juniors. They won, which put them in a three-way tie for champion of the league. Tonight´s the final match of a three-game playoff of sorts ot identify which of the three takes the crown. I had a much better seat at the last game. I could actually see the rest of the stadium. And in case you didn´t understand it before, security really is a big deal. 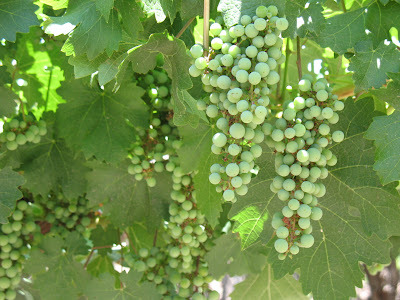 Mendoza is the country´s main wine region. To enjoy what the area has to offer, it´s popular to hop on a bike and tour some vineyards. With the help of Mr. Hugo, several of us grabbed bikes and pedaled from site to site. We visited three vineyards, a chocolate/liquour factory and an olive plantation. Upon returning to Mr. Hugo´s, we were treated to bottle after bottle of local wine--all included in his 25-peso fee. Now I´m in Córdoba, the nation´s second-largest city. I´ll spend Christmas here--there´s some great folks staying at the hostel. I´ll be back in BA for New Year´s festivities. Sounds like I´m going to spend the evening with some folks who work at my hostel there--a good group of locals.